Choice of User Interfaces: Seehau from ICE Technlogy and ChipView-x51. Seehau: runs under Windows 95, 98, NT, ME, 2000, & XP. 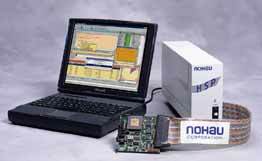 Emulation and trace ISA boards install in your PC or in the Nohau® HSP box (shown) and controlled via the PC LPTx port. Also, available in a USB Box interface. The optional trace board can be installed or upgraded later. Trace memory is real-time: up to 256K deep by up to 96 bits, 8 trigger levels, with timestamp, filtering and an external trigger output. Ports P1 and P3 are also recorded. 64K hardware breakpoints, Bank Switching, Program Performance Analysis (PPA), and Code Coverage.